It seems I was premature in describing Rigoberto Uran’s return to fine fettle. He’s still not dead, but doctors are frowning at his charts. On stage nine, a familiar sequence of events played out. 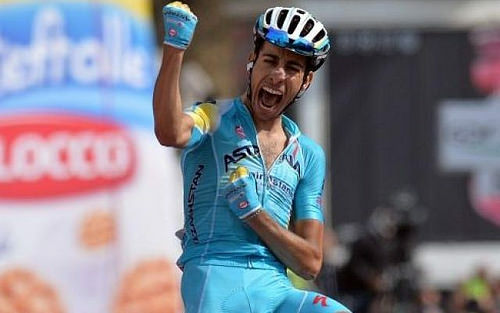 Fabio Aru attacked and his main rivals followed – except for Rigoberto Uran. The top riders opened a gap on the peloton; Uran lost more time. The manner in which the stage was decided was familiar too. It seems to be inevitable in this race that someone from the break will manage to stay away and win each day. On this occasion, it was 37-year-old Paulo Tiralongo. Tiralongo rides for Astana and this is yet another recurring theme. So far, the men in blue have been knocking seven shades of shite out of everyone else in this race. It may not be reflected at the very top of the leaderboard, but if you look at the top ten, it’s fairly apparent. Aru may be second, but there are three Astana riders in the top five. Mikel Landa is fourth and Dario Cataldo is fifth. Their dominance has been most obvious during the racing, however, where they have pretty much laid out towels at the front of the peloton to reserve their spots. Once there, they ride at an infernal pace. Everyone is suffering, but the big question is can it last? We’re only just over a week into the race and there’s plenty of tough stuff to come. Aru could find himself unusually lonely on third week mountain stages if everyone’s spent. Rest day first. Tuesday then brings a 200km flat stage.